I’m very excited about today’s blog post because it features 2 things that I love…A LOT. 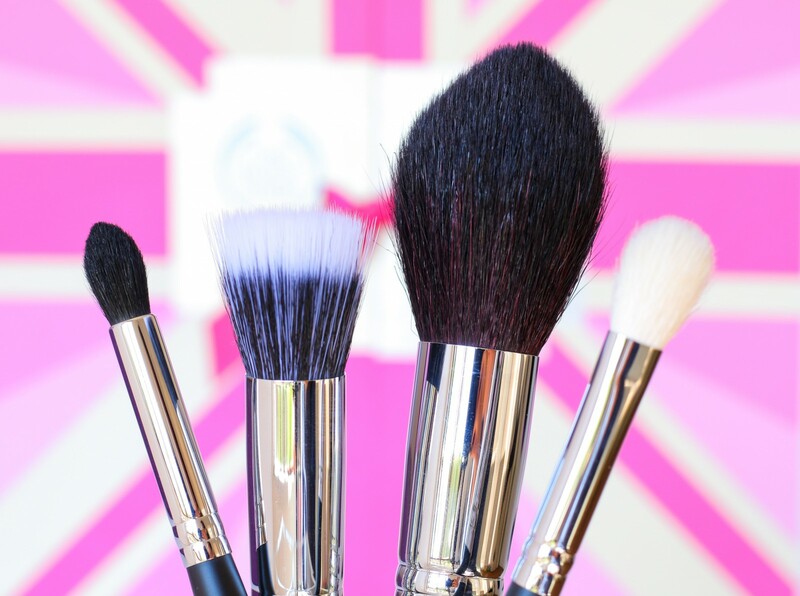 Firstly, it’s a blog post all about makeup brushes – and for the record, I think brushes are currently my ultimate favourite makeup-related product in the world. And secondly, today’s blog post reminds me of lucky packets too! Okay, so these days I don’t really buy lucky packets anymore (I was obsessed with them as a teeny tiny little Luzanne) but I do still love a good surprise! So, I was googling reviews on some of the brushes I thought I might be interested in and saw a YouTube review video on #MorpheMe brushes. I was so excited after watching the video because it was EXACTLY what I needed in my life – a monthly subscription service (you can cancel anytime) that sends you a selection of Morphe makeup brushes each month with a minimum value of $30 (+-R400) but you only pay $19,99 per month. To have your MorpheMe parcel shipped to South Africa (via DHL GlobalMail postal service), there is an additional shipping charge of $6,99 – which brings the total amount to $26,99 (about R360,00). If you’re based in the US, then shipping is free. I’ve received my MorpheMe brushes for the past 2 months (my 3rd is on the way) and I have found I usually receive my parcel within 3 to 4 weeks – please note, the first time I paid R22,00 in duties charges when I collected my parcel at the post office, and the second time there were NO customs / duties charges due. So I guess there’s no way to know for sure whether any duties charges will be applicable on a monthly basis, but I do plan on showing you each month what I received in my #MorpheMe parcel so I’ll be sure to mention if any additional charges were applicable during that specific month. I guess you could use a freight forwarding company like Aramex if you want to receive your parcel within 2 weeks, but I haven’t used them in over a year – ya’ll I have been burned by them on a number of different occasions, so I am no longer using their service (plus using a courier service will add to the overall cost of your monthly delivery). Let’s take a look at the brushes I received in my March bag, shall we? 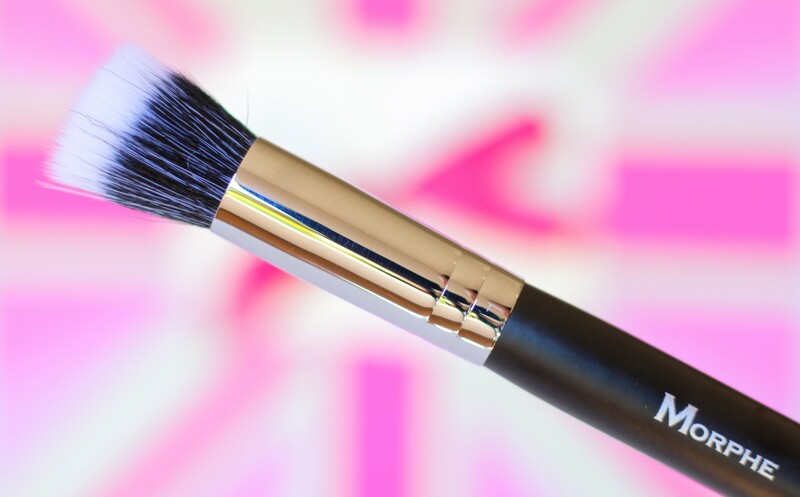 And after that I’ll share ALL the deets you need to know about the MorpheMe Brush Club. Be sure to use my special referral link (I don’t earn any money) if you decide to sign up for the service, because you’ll be able to choose a FREE Morphe makeup brush when you checkout. Please note: I’m still deciding whether I should just call these blog posts ‘MorpheMe Brush Club #1 / #2 / #3’ etc. or whether I should specify the month, because I usually receive the brushes almost a month after they’re sent to me. So it might look like I’m uploading the blog post waaaaay too late each month, and that’s why I’m considering just numbering the blog posts. I haven’t received my April brushes yet, I imagine it has been delayed because of all the public holidays we’ve had but I’ll upload that blog post as soon as I have my brushes in-hand (that reminds me, I should probably go check our post box). Help a sister out – please let me know what you think I should call these blog posts in the comments section below? First up we have the brush I was most excited about, the Morphe M401 Large Pointed Powder Brush (retails for $13,99 or +- R190,00). This is basically a dupe for the MAC 138 Tapered Face Brush and the Sigma F25 Tapered Face Brush, both of which I have in my collection. The brush bristles are made from sable hair, and I must be honest, it’s actually softer than the aforementioned brushes – really impressed with this brush! 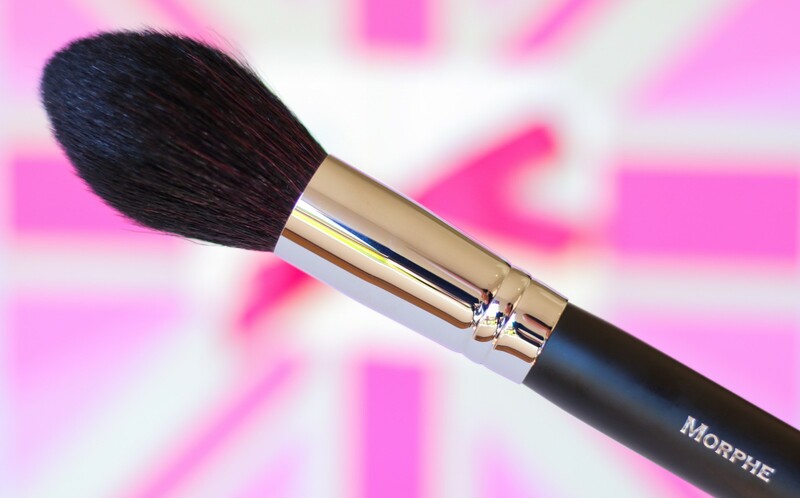 The brush has a large tapered tulip shape, perfect for setting under eye concealer with a powder, bronzing, contouring the cheekbones & forehead (and even down the sides of the nose), highlighting, applying blush, or even powdering the entire face…it really is such a multi-functional brush. Remember, natural hair bristles work best with powder makeup products. Next up we have the Morphe M436 Mini Duo Blender Brush (retails for $6,99 or +- R95,00). Another dupe for other high-end brushes, this brush is a more affordable version of the MAC 130 Short Duo Fibre Brush and the Zoeva 122 Petit Stippling Brush. 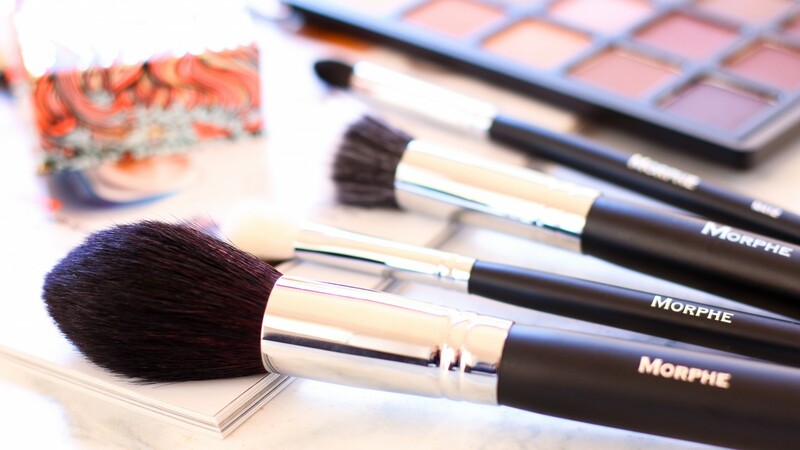 The brush features a blend of both synthetic and sable bristles, which means it works a treat with both cream and powder products. I’ve used my MAC 130 brush for years and years, and it does a superb job of applying & blending out my liquid highlighters and any cream-based sculpting products. The short, flat shape of the brush is smaller than your average stippling brush, so it can easily be used for the areas around the eyes and nose too. I’ve seen people also use this brush to apply foundation, but I find the bristles are not dense enough for my liking (so it ends up looking a bit streaky). If you watched my recent ‘Best Of Beauty 2016’ makeup tutorial video, then you’ll know I love blending my powder bronzer out with a duo fibre stippling brush – I just find the bristles ensure I get a seamless blend. Then we have the Morphe M412 Deluxe Pointed Blender Brush (top) from the Master Pro Collection (retails for $5,99 or +-R80,00). I must be honest, I was pleasantly surprised by how soft all these Morphe brushes feel to the touch. Usually natural hair bristles can tend to feel a bit scratchy (if you’ve ever ordered really bad brushes off eBay, then you’ll know what I mean) but so far, I haven’t come across a single Morphe brush that felt harsh on my skin. This eye brush is definitely a dupe for the Sigma E45 Small Tapered Blending Brush (it’s just a bit bigger) and the MAC 224 Tapered Blending Brush (although the Morphe brush is a bit more pointy). What I love about it is that the bristles (sable hair) are super soft and fluffy, so not only does the M412 deposit colour exactly where you want it (crease, outer V, brow bone, inner corner), it also blends and buffs it out seamlessly. This has become one of my staple eye makeup brushes, and these days I reach for it every single time I sit down to do my makeup. Lastly we have the Morphe M521 Chisel Oval Shadow Brush (bottom) from the Flawless Collection (retails for $5,99 or +-R80,00). Another winner in my book – gosh, I’m so happy I loved every single one of the brushes I received this month! This eye brush can be duped for the MAC 217 Blending Brush, the Zoeva 227 Luxe Soft Definer Brush, and the Sigma E25 Blending Brush but I have found the Morphe brush is just a tiny bit softer (the bristles are made of goat hair). For the longest time the MAC 217 brush was my holy grail eye makeup brush (I still love it) but I’ll be honest, these days I prefer scouting the internet for more affordable options (I just can’t justify spending R340,00 on a single eye makeup brush). The Morphe M521 is a smidgeon larger than the other aforementioned brushes, but I actually like the size because it covers a larger area of the lid & crease and so I feel it blends everything out a lot faster. I’ve also used it to blend out my nose contour (on the days I do sculpt my nose), and it does a brilliant job of that too! You’ll see I’ve included another brush in the above photo, it’s the brush I received with my very first MorpheMe delivery (I signed up via a referral link). There was a choice of 3 or 4 different brushes (even face brushes) but I chose the Morphe M214 Oval Shadow Concealer Brush because it looked so interesting. I don’t own any other brush like this one (it does look very similar to the MAC 233 Split Fibre Eyeshadow Brush, but I wouldn’t say it’s a dupe). The shape of this brush reminds me of an eye shader brush, but it’s a little bit bigger – the brush features a 50-50 split of natural sable hair on the one side and synthetic fibres on the other. That means, you can use just this one brush to apply a creamy eyeshadow base using the synthetic side and apply a powder eyeshadow with the natural hair side. I haven’t used this to apply / blend out my concealer yet, but I imagine the flat shape will help to pat it into the skin nice & easy (like the hair dye…haha!). Important: I’ve given all the above brushes a good wash at least once, and haven’t experienced any shedding thus far. TOTAL VALUE: $33 (or +- R440,00) and I paid R377,00 which includes shipping to South Africa. It also depends on the exchange rate, for example, I only paid R338,00 for my first parcel because the Rand was a bit stronger back then. 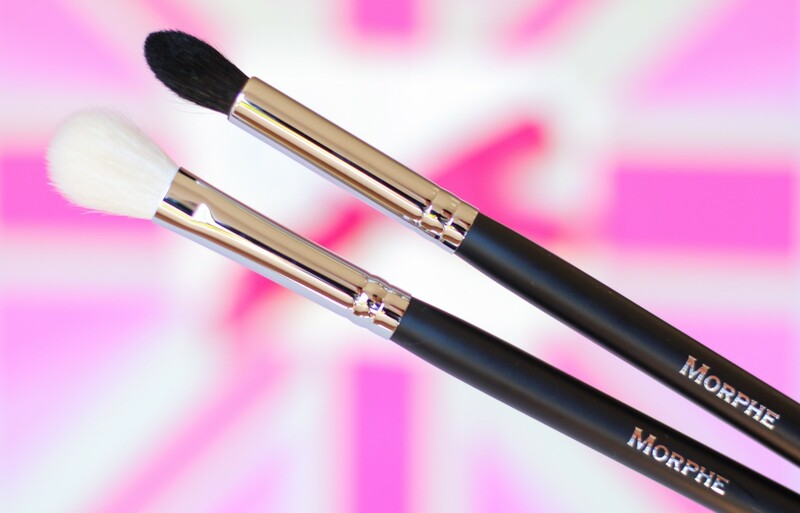 ♥ You can use my referral link to receive a free brush when you sign up for MorpheMe Brush Club. As mentioned earlier, this is not an affiliate link – thus I don’t make money from any sales generated using it. ♥ There are 3 subscription options available: Monthly, 6-Months or Annual. ♥ Every month you’ll get anywhere from 3 – 7 new Morphe brushes, plus they’ll ensure you never receive the same brush twice (although, to be honest, I wouldn’t mind having duplicates of some of my favourite brushes). Some months include more expensive brushes so there will be fewer of them. Other months include less expensive brushes so there will be more of them. I saw one of last year’s bags included 7 brushes. My very first MorpheMe bag was the February 2017 one, and I received 3 beautiful face brushes from the Morphe Gun Metal Collection. ♥ You can cancel your subscription anytime, skip months you don’t want or trade for a different set of brushes (just make sure you log on to your Liveglam MorpheMe account before your next set is shipped out). ♥ For each month you’re an active member, you earn 100 reward points. You can spend these reward points on free products (they have brands like Tarte, ColourPop, House Of Lashes, Stila. Becca, Kylie Cosmetics, Anastasia Beverly Hills etc) and free Morphe brushes. ♥ MorpheMe starts a new ‘brush month’ on the 23rd of each month. So, if you sign up on the 23rd of May, you’ll receive the June brushes…anything before the 23rd, you’ll still receive the brushes from that same month. ♥ You’ll receive a DHL GlobalMail tracking number to track your parcel each month, this will be emailed through to you as soon as your MorpheMe parcel has been shipped. ♥ LiveGlam also has a ‘KissMe Lipstick Club’ and a ‘PolishMe Nail Polish Club’ that you can sign up for. I vote for MorpheMe Brush Club #1 Review or something like that, if you name the specific month it might not be relevant to most people anymore. I absolutely love this subscription and these brushes have become my go too. Great review! I’ve used Aramex quite a bit the last few months and besides one package I waited 2 weeks for, they’ve been very efficient. Also if you pay with FNB delivery is much cheaper…around 8 or 9 dollars I think. When I used Liveglams delivery I waited 2 months almost for my first set. PS I Really wanted to buy the Mac 217 as I wanted the smaller version of the Morphe 521, but gee whizz…at R330 for the brush I was like….no ways! Thanx for introducing me to this, I have signed up with your link. I chose the M431 precision pencil crease brush, can’t wait for my package to arrive. OMW! that is terrible…I used Aramex for my May brushes…will definitely go back to the post office route and wait it out. Thank you. OMW! You are also on the Liveglam Morphe Me subscription! Thanks to Belle for the tip…My experience with the post office is so frustrating that I opted to receive them through AGS. I still have not receive my April brushes and my May brushes are alread at O.R customs. So excited about this subscription and cant wait to read your reviews on the monthly brushes…. Yeeeeesssss, so excited!!! Just signed up for the monthly one!!! I would probs number the posts, and not name them each month. Your photos are the best, always so pleasing to the eye. I’ve signed up for the 6-months subscription, can’t wait for my first delivery!! Hehe! Oh gosh, Aramex Global Shopper has played me in the past (charging 100% in customs fees). I’m probably better off just getting the brushes sent via the post office. Thanks for informing us of this, Luzanne. It’s because of you that I have makeup products and brushes in my collection that I never thought of owning, you always keeping us well informed. Hallelujah! I’m going to click your link and sign up directly after writing this comment. Thanks so much for enlightening us…for some reason I had the impression the MorpheMe subscription would be very expensive for us in SA but I’m delighted to see how affordable it actually is. Just signed up for the monthly option, thanx Lu. 😀 Excitement levels are through the roof!!! YAAAAAS! Need some morphe brushes in my life asap! Purchased from Morphe via post and Aramex recently just to experiment with both delivery services. Aramex was too much effort; too costly and took just over month to get the delivery. They also wanted a commercial invoice which Morphe doesn’t provide if you are shipping within the US. I just emailed them for an invoice and they emailed one to me within 24hrs. What invoice did you use for Aramex? They don’t seem to give you a formal invoice, would the order form do? Thanks for this blog. So glad I read it. Hi, I signed up for the Morphe brushes and have just been phoned by DHL and I had to pay R310 in customs charges.